Vær sikker på at få en god pris på Pension Albergue Alborada - vurderet til 8,8 af andre gæster. 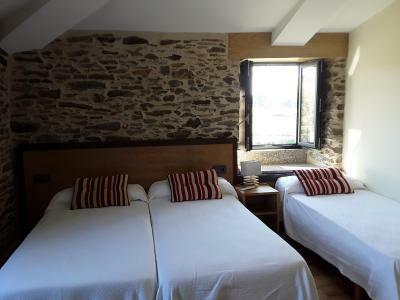 We booked a twin room for our stay while walking the camino. The room was lovely with a great bathroom. 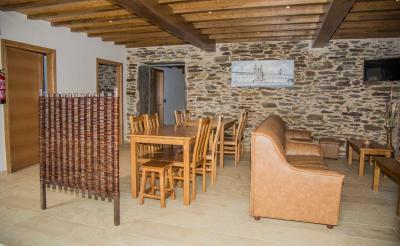 There is a very good kitchen and a comfortable lounge area with dining tables, chairs, couch and TV. 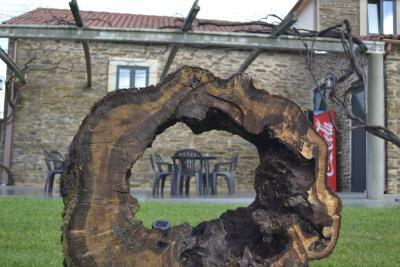 Right on the Camino, no restaurant facilities but a wonderful restaurant a short distance away. Very clean and comfortable with breakfast available before setting off. Grest cafe next to albergue which had good food and great service. The room was spacious. Gorgeous interior of wood, exposed brick and tiles. Bathroom all new. View of fields from window. Another brilliant find on Booking.com. The room and location next to a great restaurant and bar. It was clean. The staff were helpful. 5he pension room was fine. There was no bar/cafe but there was a nice one about five minutes away. We had dinner there. The staff were so helpful in putting down an extra bed for my sister in our room as I had misbooked her accommodation and they were fully booked. The pension is right on the Camino trail so easy to access. There is a great restaurant 100ms down the road. Clean comfortable room and great staff. Amazing and super cozy little place! We didn't expect it to be THAT cute at all. Definitely recommend it if you are doing the Camino, or if you are searching for some romance below a wooden lamp. 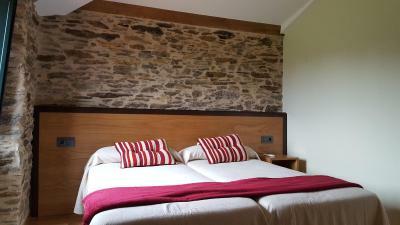 "We booked a twin room for our stay while walking the camino. 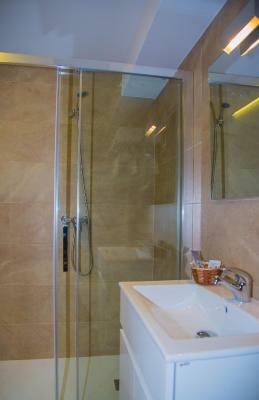 The room was lovely with a great bathroom. " 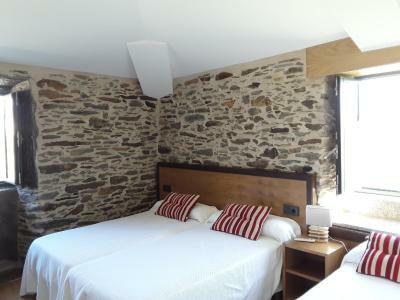 "Right on the Camino, no restaurant facilities but a wonderful restaurant a short distance away. Very clean and comfortable with breakfast available before setting off." 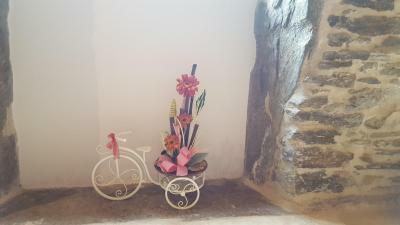 "Grest cafe next to albergue which had good food and great service." 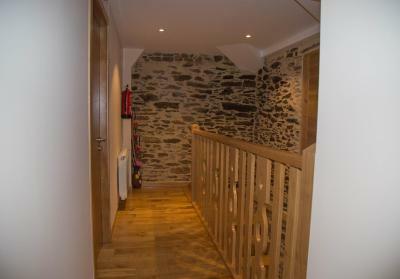 "Private rooms at back were really quiet despite main road location. Nice restaurant 100 m away for dinner"
"The room was spacious. Gorgeous interior of wood, exposed brick and tiles. Bathroom all new. View of fields from window. Another brilliant find on Booking.com." "The room and location next to a great restaurant and bar." 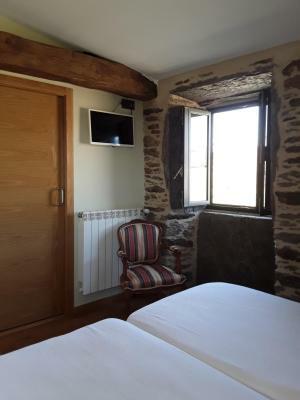 "probably the best accommodation on the Leon-Santiago de Compostela route, modern, newly renovated accommodation, clean rooms, comfortable bed, quiet outdoor seating, kitchen, friendly staff, right..."
"It was clean. The staff were helpful. 5he pension room was fine. There was no bar/cafe but there was a nice one about five minutes away. We had dinner there." "The staff were so helpful in putting down an extra bed for my sister in our room as I had misbooked her accommodation and they were fully booked. " "Amazing and super cozy little place! We didn't expect it to be THAT cute at all. 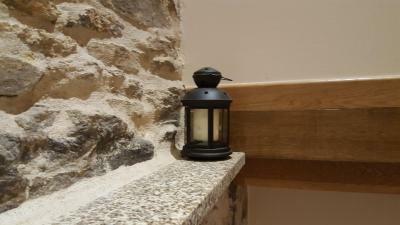 Definitely recommend it if you are doing the Camino, or if you are searching for some romance below a wooden lamp." 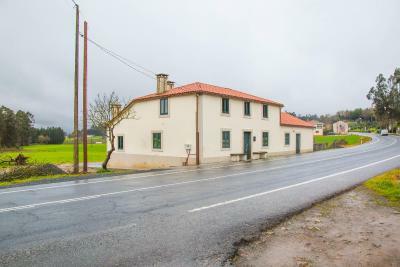 Pension Albergue Alborada tilbyder gratis WiFi samt indkvartering i O Pino, 8 km fra byens centrum og 27 km fra Santiago de Compostela. Der er gratis privat parkering på stedet. Nogle af ferieboligerne har opholdsområde, hvor man kan slappe af efter en travl dag. Der er også fladskærms-tv. Der er fælles køkken på ejendommen. Sada ligger 47 km fra Pension Albergue Alborada, og Betanzos ligger 40 km fra ejendommen. 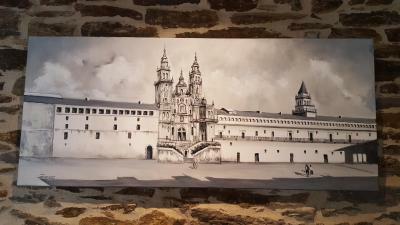 Den nærmeste lufthavn er Santiago de Compostela Lufthavn, 11 km fra Pension Albergue Alborada. Par er særligt glade for beliggenheden – de har givet den karakteren 8,3. Dette overnatningssted har fået en god karakter for "Valuta for pengene" i Salceda! Gæsterne får mere for pengene i forhold til andre overnatningssteder i byen. Pension Albergue Alborada har budt gæster fra Booking.com velkommen siden d. 31. maj 2016. Hvornår ønsker du indkvartering på Pension Albergue Alborada? This dormitory room has a dining area, kitchenware and stovetop. Dette 2-personersværelse har et opholdsområde. Gratis! WiFi er tilgængeligt på nogle værelser og er uden beregning. 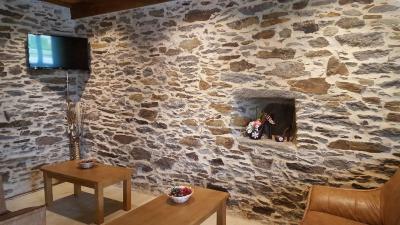 Før du booker Pension Albergue Alborada tager imod forespørgsler! Angiv dit ønske i næste trin. Yderligere børn og voksne kan indkvarteres i ekstrasenge for EUR 20 per nat. 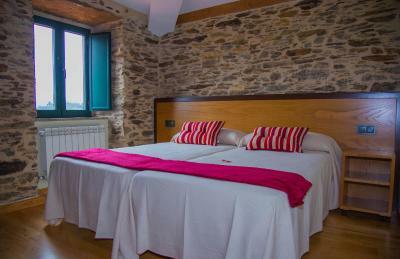 "We booked a twin room for our stay while walking the camino. The room was lovely with a great bathroom. There is a very good kitchen and a comfortable lounge area with dining tables, chairs, couch and TV." "The room was spacious. Gorgeous interior of wood, exposed brick and tiles. 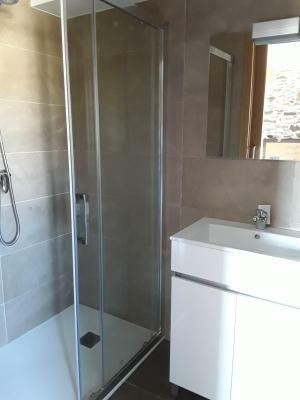 Bathroom all new. View of fields from window. Another brilliant find on Booking.com. " 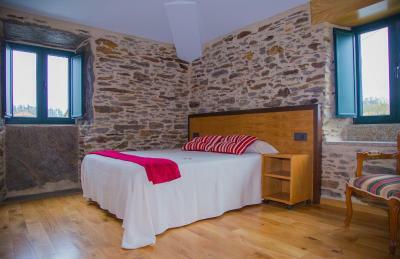 "probably the best accommodation on the Leon-Santiago de Compostela route, modern, newly renovated accommodation, clean rooms, comfortable bed, quiet outdoor seating, kitchen, friendly staff, right next to the road, but nothing goes by the road at night, I recommend"
"The staff were so helpful in putting down an extra bed for my sister in our room as I had misbooked her accommodation and they were fully booked. 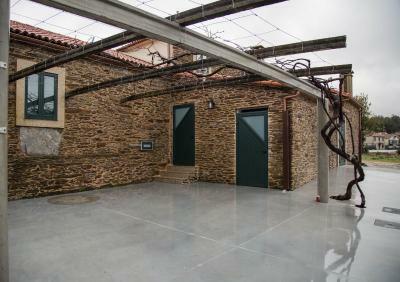 The pension is right on the Camino trail so easy to access. There is a great restaurant 100ms down the road. Clean comfortable room and great staff."